Feeling lucky? No? 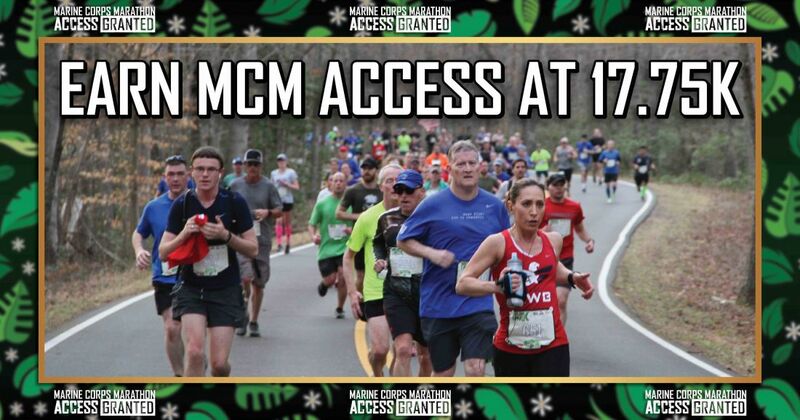 Well, there's a way to bypass the MCM Lottery and still secure an entry by running your way into the 44th Marine Corps Marathon. Remove luck from the equation and get ready to register for the high demand Marine Corps 17.75K. Schedule a lunch break on your calendar. Take the day off. Do whatever it takes to be on your device and lock down a spot in the 17.75K when registration opens on Wednesday, February 20 at noon eastern. The Marine Corps 17.75K travels through the stunning trails and hills of Prince William Forrest Park. It is a uniquely Marine event, as the 17.75K distance reflects the year the Corps was established. Registration opens at noon EST sharp and is expected to sell out in minutes. Last year, the Marine Corps 17.75K sold out in record-breaking time in seven minutes, 25 seconds with runners claiming entries from 42 states, the District of Columbia and four countries. To improve the odds, more than 200 entries have been added this year, expanding the field to 3,300 runners. Where: www.marinemarathon.com The link will be posted on the MCM website homepage, on Facebook and on Twitter. Cost: $80 for runners ages ten and above. New this year, runners and their families can extend their Marine Corps 17.75K experience with a night of carbo-loading and comradery at the MCM Motivation Dinner Series. The first dinner in the three event series will be held on March 22, the eve of the Marine Corps 17.75K. The Dinner allows anyone the opportunity to dine where Marines dine and receive motivation from accomplished U.S. Marine athletes. Tickets may be purchased during registration or through the Marine Corps 17.75K webpage. This new accompanying event features a menu of savory pasta dishes, multiple sauce options, healthy salads and warm cookies at The Clubs at Quantico for only $20 per person. Each dinner will feature the Marine Corps Base Quantico Ceremonial Platoon providing colors with the Quantico Marine Band playing the National Anthem and traditional Sousa marches. While the dinners will be held on the eve prior to scheduled MCM Event Series runs, participation in these events isn’t required to purchase tickets. The featured speaker at the March dinner will be Colonel William C. Bentley, III, Commander of Marine Corps Base Quantico. In addition to a distinguished military career, Col. Bentley is an accomplished athlete boasting a 30-year commitment to health and fitness including eight Marine Corps Marathon finishes. He grew up playing a variety of sports through high school including baseball, softball, basketball, soccer, football and wrestling. In college, he played football, participated in various intramurals and was on the boxing team at The Citadel. Col. Bentley has completed numerous triathlons at Olympic, sprint, duathlon and half iron distances.